We’d love your help. 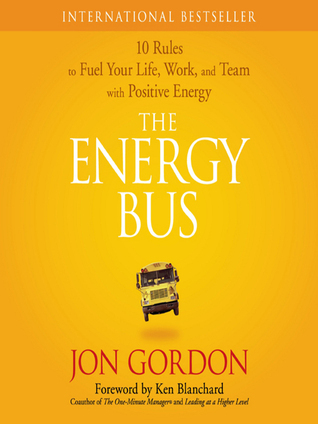 Let us know what’s wrong with this preview of The Energy Bus by Jon Gordon. Everyone faces challenges. And every person, organization, company and team will have to overcome negativity and a In this best selling business fable, The Energy Bus, takes listeners on an enlightening and inspiring ride that reveals 10 secrets for approaching life and work with the kind of positive, forward thinking that leads to true accomplishment - at work and at home. To ask other readers questions about The Energy Bus, please sign up. I'm just so curious...has anyone else considered this a retelling of the Bhagavad Gita? A man seemingly at his peek (career/leader) wakes up one morning to the fall-out of a work/life crisis. In a moment of lonely despair, he is met by the chariot/bus driver of a lower class/caste and learns that this person possesses great wisdom. Then he spends 90% of the text learning this wisdom. Essentially, humility. Anyone? Why is it that I hate business self-help books written by motivational speakers? Is it because I receive them from my employer? Is it because I look at the $21.95 price tag for an hour reading and think "Why can't I get on this gravy train?" Is it because the grammar mistakes make me scream: "This publisher has illiterate editors!"? Is it because they take attributes I actually believe in and trivialize them? Is it because I hate anything that has a mission statement? Perhaps. But the most impor Why is it that I hate business self-help books written by motivational speakers? Is it because I receive them from my employer? Is it because I look at the $21.95 price tag for an hour reading and think "Why can't I get on this gravy train?" Is it because the grammar mistakes make me scream: "This publisher has illiterate editors!"? Is it because they take attributes I actually believe in and trivialize them? Is it because I hate anything that has a mission statement? You are what you feel." I work for a public school system. We are out for the summer. As we staff members joyfully fled the building, we were handed this book for summer reading. Evidently, next school year, we can anticipate fun activities based on the book's theme and message. Here is the email I sent my principal. You've been a great boss this year. I appreciate your sense of purpose, your pragmatic way of getting things done, and the support you give your staff. But, oh my. I just finished reading THE ENE I work for a public school system. We are out for the summer. As we staff members joyfully fled the building, we were handed this book for summer reading. Evidently, next school year, we can anticipate fun activities based on the book's theme and message. Here is the email I sent my principal. But, oh my. I just finished reading THE ENERGY BUS. Not only do I travel on a different bus, but it runs in a parallel universe. Certainly not the jolly universe of this book. In fact, my vehicle is not a bus at all. I would never burn fossil fuels in a combustion engine. Mine is sort of a hybrid time-travel & transporter machine. Please don't ask me to turn in a bus ticket, and please don't ask me to "trust in God." (128) Is it even legal for you to require staff to read a book that advocates a religious belief system? Or to use school funds to purchase multiple copies of said book? For the record, I am an existentialist with a keen interest in Buddhist philosophy. On spiritual matters, I prefer Shantideva's THE WAY OF THE BODHISATTVA from the 8th century. Or perhaps the 12th century Islamic Sufi fable by Farid ud-Din Attar, THE CONFERENCE OF THE BIRDS. Have an excellent summer, and enjoy some good reading. I just finished Thomas Piketty's CAPITAL IN THE TWENTY-FIRST CENTURY and Anthony Trollope's THE WARDEN. I highly recommend both. I was required to read this book by my principal. This book reminded me a bit of another book I listened to last summer on CD, A Complaint Free World. Both books are brimming with painfully uncreative (because they're so blatantly obvious) extended metaphors that one could surmise the meanings of without reading or listening to the book one iota. Their intention is purposeful and righteous, but the method of communicating the ideas just doesn't motivate me. When I read self-help books, I like th I was required to read this book by my principal. This book reminded me a bit of another book I listened to last summer on CD, A Complaint Free World. Both books are brimming with painfully uncreative (because they're so blatantly obvious) extended metaphors that one could surmise the meanings of without reading or listening to the book one iota. Their intention is purposeful and righteous, but the method of communicating the ideas just doesn't motivate me. When I read self-help books, I like them to challenge and motivate me to think more deeply about a personal or professional issue, rather than be laid out in predictable fashion. When I read a title of a book, I want it to lead me on, grab my attention, entice me to read more. Without that mystique and depth, a book rarely appeals to me. In addition, books are always more appealing when they are your 'chosen One.' Being forced to read this book was an encouraging reminder that it is a good thing that I allow my students to choose their writing topics for each project. They need to be intrinsically attached to their projects. I believe that 'Student Choice,' an element of Differentiation, is essential to good teaching. It would have been nice to have received options for self-help books and been able to choose the book that appealed the most to me. But alas, it is finished and I will never recommend this book to anyone. 1. A man named George is feeling discouraged and disgruntled about both his personal life and his professional life. 2. He has the bad luck of a flat tire and his wife won't take him to work because she's busy with the kids and the dog. He not only is going to be late for work, but also must ride the city bus. 3. George is greeted by the jovial busdriver, who not-so-coincidentally is named Joy. She also intermittently possesses a dialect which I believe is meant to stereotypically indicate something about her socioeconomic status and/or cultural background. The gist is that she has not had an easy life but is still glowingly optimistic and spreads her enthusiasm and JOY (See, not a coincidence at all!) to others. 4. George at first is not willing to try Joy's tactics for positivity and optimism. 5. Joy slowly but surely wins George over. She is persuasive, I tell you. 7. George begins to follow Joy's rules. These rules are dripping in metaphors relating transportation to life. Even the title is sopping wet: "10 Rules for the Ride of Your Life." 8. George is met with criticism and constructive criticism, but forges ahead. 10. George's life has changed. He now knows it's "more fun on the bus." "God keeps breaking your heart until it opens." "... Every struggle, every challenge, every adversity brings you closer to your heart, to your true self, to who you really are." FML I am on a short bus to hell.. The underlying message of the book is positive, if delivered in a pedestrian manner. Reading this book is like having someone beat you over the head repeatedly with a metaphor. My main complaint which overrides most of the positives from the book is the same thing with all this author's works--the religious themes that go along with it. If this book is supposed to inspire workers to work hard, then it should not assume us all to be Christian. As a non-believer I see what my company was going for The underlying message of the book is positive, if delivered in a pedestrian manner. Reading this book is like having someone beat you over the head repeatedly with a metaphor. My main complaint which overrides most of the positives from the book is the same thing with all this author's works--the religious themes that go along with it. If this book is supposed to inspire workers to work hard, then it should not assume us all to be Christian. As a non-believer I see what my company was going for in giving us this book to read, but I can't help but feeling marginalized since it is just ASSUMED in this country that we are all on board with the God thing. I think that inspiring workplace productivity in a team requires extreme inclusion for all religious viewpoints and beliefs and find it extremely shortsighted for this author to continue throwing his religious beliefs into his books. this book is just painful. the latest thing for managers to do, it would seem, is pass around these business fable books -- fairy tales for the cubicle world -- and they are just plain BAD. badly written by motivational speakers with product tie-ins, these facile little tales take common sense ideas and turn them into Words Of Wisdom which are apparently supposed to lance their eternal truths into our souls through a folksy tale written at the fourth grade level. i can only hold out the hope tha this book is just painful. the latest thing for managers to do, it would seem, is pass around these business fable books -- fairy tales for the cubicle world -- and they are just plain BAD. badly written by motivational speakers with product tie-ins, these facile little tales take common sense ideas and turn them into Words Of Wisdom which are apparently supposed to lance their eternal truths into our souls through a folksy tale written at the fourth grade level. i can only hold out the hope that my boss got this book recommended to her and passed it on without reading it, because if she did read it and found it so enlightening that she had to share it with the rest of us, i will be very depressed. The message is a good one in this short book, but it is a real shame that the editing (or lack thereof) is such a distraction. Wiley Publishing should be ashamed of themselves for the horrendous job they did... there's no excuse for the lack of commas (several passages could be used in the next "Eats Shoots and Leaves" edition) and very blatant errors throughout. Forced to read it for work. Slammed head into desk. I'm not a third grader. I'm not an energy vampire this book is just bad. I read this for a work thing, even though we already had the discussion group and I could probably have gotten away with "forgetting". Conscientious, that's me. Anyway, this is an extended conversion fable walking us through the fictional "George" who needs to turn his life around or be fired and lose his wife and family. He's such a grump, is George, and all that negative energy is killing his relationships. Good thing he gets on the bus after his car breaks down and meets "Joy" the bus driver w I read this for a work thing, even though we already had the discussion group and I could probably have gotten away with "forgetting". Conscientious, that's me. Anyway, this is an extended conversion fable walking us through the fictional "George" who needs to turn his life around or be fired and lose his wife and family. He's such a grump, is George, and all that negative energy is killing his relationships. Good thing he gets on the bus after his car breaks down and meets "Joy" the bus driver who proselytizes the boo-hoo out of him. And yes, all the didacticism of this is fairly blatant. To the book's credit, really, as it isn't trying to hide that it's an extended allegory or convince us this is true-life experience (except when it is, but I'll get to that). The core of the message isn't that bad, really. If you boil things down to "look for the good" and "love other people" and "do the best you can and then do your best with the consequences" then I suspect it works out pretty well. As a paradigm for selecting actions, you could do worse. And I even found myself thinking "yeah, I should do this" a time or two, and that's no small thing. That said, this isn't anything you can't find in any other motivational book. And the veneer is very thin on the "story" with a lot of people doing and saying things that make them sound like marionettes activated by a hippie cult after a hit of "the good stuff". And then the author has this tick where "Marty the googleman" would pop in with "research" that, even if true (and at least half of it is complete bunkum), is bent into a pretzel to make Joy's point—like going from "scientists can sense heartbeats between five and ten feet away from your body" to "the people around us pick up on our love for them because they can literally feel it". Also, I suspect this works better for people whose work isn't "make this emotionless machine do what you want it to". A positive outlook isn't going to impress Mr. Computer out of his reluctance to just do the thing and stop griping about "out of memory" and "key already exists" and "I dunno man, something happened and I barfed". I had to read The Energy Bus for work and am so sad to see that works rife with neuromyths and quasi-scientific nonsense are still being peddled throughout school districts and other businesses throughout the country. The whole premise of the book can be boiled down to this: if you are positive you will attract positivity to your life, which you are in control of, but only when you're positive. What makes things worse is the author's poorly written parable that he uses to explain all of his "rul I had to read The Energy Bus for work and am so sad to see that works rife with neuromyths and quasi-scientific nonsense are still being peddled throughout school districts and other businesses throughout the country. The whole premise of the book can be boiled down to this: if you are positive you will attract positivity to your life, which you are in control of, but only when you're positive. What makes things worse is the author's poorly written parable that he uses to explain all of his "rules." I saw this title while browsing for some audio books to download for my commute. This was only 3 hours long, and I'd had lots of people ask about it in my bookselling days so it jumped out at me. I'd never read any "business fables" (or "business jerk books" as I always mentally referred to them), so I thought it would be interesting to see what all the hype was about. I'm truly not sure why or how I made it through all three hours, but wow. If books like this are keeping America's corporations I saw this title while browsing for some audio books to download for my commute. This was only 3 hours long, and I'd had lots of people ask about it in my bookselling days so it jumped out at me. I'd never read any "business fables" (or "business jerk books" as I always mentally referred to them), so I thought it would be interesting to see what all the hype was about. I'm truly not sure why or how I made it through all three hours, but wow. If books like this are keeping America's corporations afloat, we have bigger problems than I thought. I despised this book so much that I made a bullet pointed list of reasons why it was terrible, but I eventually got too depressed to keep writing it. Reason number one, though, was that the audio book is narrated by the author and he is TERRIBLE. I couldn't understand why no one bothered to tell him that the word "especially" DOES NOT CONTAIN THE LETTER X. Or that words that end in -ing HAVE A G AT THE END. While the narration was grating, the content was even more painful. The whole book had the air of a student desperately trying to pad out an essay to meet a minimum page count requirement. The chapters must be about 3 pages long, because every few minutes there was a chapter break. Also, "George" accounts for about half the words in the book (he's the central character in the 'fable'). Seriously, his name is repeated so often I can't describe it. Then there's the totally weak "facts" that back up the 10 energy bus rules. The ones I could remember are that the law of attraction is real, most people die on a Monday because they'd rather die than go to work, your heart emits a frequency that can somehow be positive or negative (which affects your cells! somehow...), and more such garbage. And let's not forget that "everything happens for a reason" and "God is looking out for you" and you will be "too blessed to be stressed." How is this a mainstream "business" title? We (and George, don't forget George!) learn all this from a bus driver named...Joy. Joy calls people "sugar" a lot and was done with a slightly southern accent in the audio book, which was vaguely unsettling. She's super passionate about the 10 rules, even when those rules are creepy, like "love your passengers." This allows Joy to tell George that he should deeply and passionately love all his employees. Please don't, George, HR is gonna get called. Sure, respect your employees, reward them for a job well done, etc., etc. But this is not true love. Stop being weird. But the real point is that all the rules are feel-good, positive thinking mumbo jumbo that aren't actionable or practical or groundbreaking or even interesting. If you are at all interested in this book, just read the list of the 10 rules and extrapolate. Then read something useful, which this isn't. Maybe listen to the audio book if you really hate yourself. Oversimplification of suggested action if one needs to address severe cultural problems. Calling dissenters wolves and vampires doesn't address problems. Maybe the leader is unethical and should not be allowed to drive a bus?? It would be good for those in a rut who want some quick encouragement and don't want to read something substantial. A few good nuggets of trite advice in an overly simplistic format. Had to read this book for work - it was passed around as part of the 'managers' series of books we share. All ideas one could already know based upon reading siginificantly better written 'energizing your self and your team' books. Also, don't bother reading if you don't like mixing god and mgmt style. Would have been a nice pamphlet. Чудесно надъхваща книга! Думата е: енергезираща. За разлика от наръчниците за „работещи“ екипи, тук няма да намерим дълги списъци с правила и инструкции как се изгражда екип, който работи. Напротив, ще намерим себе си, разпознавайки демотивацията, недоволството, лошото настроение, липсата на енергия. Книгата зарежда с ентусиазъм, показвайки как можем да реагираме на събитията, че можем да бъдем активната страна, която ги движи; че промяната започва от нас и ние я предаваме на хората около себе с Чудесно надъхваща книга! Думата е: енергезираща. За разлика от наръчниците за „работещи“ екипи, тук няма да намерим дълги списъци с правила и инструкции как се изгражда екип, който работи. Напротив, ще намерим себе си, разпознавайки демотивацията, недоволството, лошото настроение, липсата на енергия. Книгата зарежда с ентусиазъм, показвайки как можем да реагираме на събитията, че можем да бъдем активната страна, която ги движи; че промяната започва от нас и ние я предаваме на хората около себе си. Ето и десетте прости правила. 01. Ти си водачът на твоя автобус. 02. Желанието, визията и фокусът движат твоя автобус във вярната посока. 03. Зареди се с позитивна енергия за пътуването! 04. Покани хората да се качат в твоя автобус и сподели с тях визията си за предстоящото пътуване. 05. Не си пилей енергията за онези, които не се качват в твоя автобус. 06. Постави в автобуса си табела: ЗАБРАНЕНО ЗА ЕНЕРГИЙНИ ВАМПИРИ! 07. Ентусиазмът привлича повече пътници и зарежда екипа с енергия по време на пътуването. 10. Забвлявай се и се радвай на пътуването! An easy read, probably a one-sitting job for most people. There's a layer of cheesiness you have to scrape away to really let the message in, but I like that it's presented in the form of a fictional story. It's all pretty exaggerated (the people on that bus drank the coolaid HARD) but it works in the way that it helps you to relate to the situations and apply it to your own; whether it be work, life, career or whatever. It's a pretty well-rounded lesson on positivity and perspective, how your a An easy read, probably a one-sitting job for most people. There's a layer of cheesiness you have to scrape away to really let the message in, but I like that it's presented in the form of a fictional story. It's all pretty exaggerated (the people on that bus drank the coolaid HARD) but it works in the way that it helps you to relate to the situations and apply it to your own; whether it be work, life, career or whatever. It's a pretty well-rounded lesson on positivity and perspective, how your attitude effects everyone around you, and how you can turn it around to influence your work/life/relationships for the better. I really liked this fictional story. It talks about George who sees everything negatively from his lens, whether it's his family, marriage, and career. The story takes place on a bus, which is a metaphor for life and all its paths. It emphasizes the importance of maintaining a high level of energy in everything you do, and staying away from low-energy and negative folks (also called Energy Vampires). It also highlights the ripple effect of having an overall positive outlook in the way it unifies more people around you towards a common goal. Just finished this amazing audio book! It made me feel so positive and I loved it so much that I listened to it in 3 days! It went over a lot of things I already knew, but it was a great refresher and great for anyone just starting their business. The narrator is great too and really sets a positive tone. After finishing, I realized the author is the same as the one who wrote Training Camp! No wonder I liked it so much! I truly enjoyed this book. Jon's ability to use a story to illustrate core values and approaches to respond to challenges was fantastic. When life throws you lemons make lemonade! This quote in its simplicity is full of meaning and summarizes this entire story titled The Energy Bus.. George an employee of the NRG Light Bulb Company he, is experiencing some pretty hard times. His job is on the line, his marriage has lost its flavor and is on the brink of collapse, to top things off, at the beginning of a brand new week he woke up to a nonfunctional car. George wondered why so many bad things had been happening to him, he was grump When life throws you lemons make lemonade! This quote in its simplicity is full of meaning and summarizes this entire story titled The Energy Bus.. George an employee of the NRG Light Bulb Company he, is experiencing some pretty hard times. His job is on the line, his marriage has lost its flavor and is on the brink of collapse, to top things off, at the beginning of a brand new week he woke up to a nonfunctional car. George wondered why so many bad things had been happening to him, he was grumpy, frustrated and angry, who wouldn't be . He was also blind to the positive things that took place around him, his negativity had poisoned his existence. George had to take the bus to work until his car was repaired, little did he know that this bus ride would take his life for a complete spin. He met Joy who was the bus driver of the Energy Bus, she always greeted his with a warm and friendly smile and offered words of wisdom and encouragement. Traveling on the bus each day changed Georges perception of life it made him a better man. He was able to lead a more positive and productive life. His positive energy saved not only his job, but his marriage and it improved the relationship he had with his co workers and family. This book has taught me a very valuable lesson. Many times in life as humans we face many obstacles and we allow them to get the better of us. We allow the challenges to affect every aspect of our life. When life throws us bad situations we need to stay calm, stay positive and think critically and logically. If we allow our situation to change our attitude for the worst it will affect others around us allowing them to be negative as well. The book “The Energy Bus” is not focused on any specific audience. This book should be read by people from all walks of life, it teaches you ten (10) steps to a better more productive life and how to stimulate and maintain positive energy. If society could handle it’s issues as outlined in this book the world would be a better place. I gave this book 3 stars because it was neither terrible nor great, and 3 seemed to be the middle of road score. Overall, I liked and even believe in many of the concepts Jon Gordon discusses. However, there were also many pitfalls in it since this is meant to be a management/professional book. The main issue I had was its use of "God" in the steps. It's not appropriate in a workplace unless that workplace is a religious environment, otherwise employees that are atheists or just plain not into sp I gave this book 3 stars because it was neither terrible nor great, and 3 seemed to be the middle of road score. However, there were also many pitfalls in it since this is meant to be a management/professional book. The main issue I had was its use of "God" in the steps. It's not appropriate in a workplace unless that workplace is a religious environment, otherwise employees that are atheists or just plain not into spiritual and professional commingling will possibly be turned off. I say possibly because it's not an actual focus of the book and the format's parable-style makes it obvious the author has trouble leaving his beliefs separate from his explanation of energy and relationships. Regardless, it's a quick read and an okay abridged version of life principles that are taught by Oprah, Deepak Chopra, Wayne Dyer, and many others. It talks about things like being responsible for the energy you bring to work and looking for the brighter side of problems by what they're teaching you. But it's so abbreviated that I honestly recommend going out and reading those books instead. This one is a nice introduction for a professional environment because it's so short and not exactly religious, but it does toe the line by referencing God a few times instead of The Universe or another non-religious choice. But I do think it can work if the readers know this going in and are open to bigger messages that pertain to energy and relationships in general. I liked this book. A little cheesy but some good points about positive energy. "The illusion is that we live in a physical world. The universe is made of energy. Einstein taught us that. Anything that is matter is energy so all the physical stuff we seen and even our own bodies are made of energy. This is an energetic universe, and everything about us is energy." "More people die Monday morning at 9 a.m. than any other time." "I am not bound to win, I am bound to be true I liked this book. A little cheesy but some good points about positive energy. "I am not bound to win, I am bound to be true. I am not bound to succeed, but I am bound to live up to the light I have." Abraham Lincoln. 1. Reflect more and enjoy more moments in life. 1. You're the driver of your bus. 4. Invite people on you bus and share your vision for the road ahead. 5. Don't waste your energy on those who don't get on the bus. 6. Post a sign that says NO ENERGY VAMPIRES ALLOWED on you bus. Prime example of why authors shouldn't always read their own books. And why some authors shouldn't write their own books. This seems like a half-day (tops)seminar that was padded out into a book and website (the website gets promoted in the book). And maybe that seminar was just padded out from the ten rules. The air is thin in the Energy Bus, not only because these guidelines have been presented before in more effective manners multiple times, but that the book has characters in it singing (som Prime example of why authors shouldn't always read their own books. And why some authors shouldn't write their own books. This seems like a half-day (tops)seminar that was padded out into a book and website (the website gets promoted in the book). And maybe that seminar was just padded out from the ten rules. The air is thin in the Energy Bus, not only because these guidelines have been presented before in more effective manners multiple times, but that the book has characters in it singing (sometimes literally!) how the Energy Bus rules work for them. "These rules work! The ones we're talking about now! Accept that they work before you hear them!" Did I mention that the author's kept reminding of Randy Newman? I had a constant fear that the Energy Bus was going to whip out that Toy Story song, only held in check by my knowledge of Disney's rabid copyright protection. Ug. I haven't been so annoyed at reading a book since they made us read Who Moved My Cheese? at work. Okay, so first, I got this as a rec from my WW leader. A few weeks ago, she recced a book called The Power of Habit. I figured I'd give it a go if I didn't have to spend any money on it and could get it at the library. They had it. I read it. It was pretty good. So, when she mentioned another one, I figured she was right about the first one, so I'd see if the library had this one too. The best t Ug. I haven't been so annoyed at reading a book since they made us read Who Moved My Cheese? at work. Okay, so first, I got this as a rec from my WW leader. A few weeks ago, she recced a book called The Power of Habit. I figured I'd give it a go if I didn't have to spend any money on it and could get it at the library. They had it. I read it. It was pretty good. So, when she mentioned another one, I figured she was right about the first one, so I'd see if the library had this one too. The best thing I can say is that this didn't take long to read. George wondered what Joy meant when she said he had no heart. "What do you mean I have no heart?" George questioned as he pointed to himself. "It's right here. It's not missing." Jon Gordon's best-selling books and talks have inspired readers and audiences around the world. His principles have been put to the test by numerous NFL, NBA, and college coaches and teams, Fortune 500 companies, school districts, hospitals and non-profits. He is the author of The Wal Jon Gordon is an American business consultant and author on the topics of leadership, culture, sales, and teamwork.